No time for fitness? You are not alone. 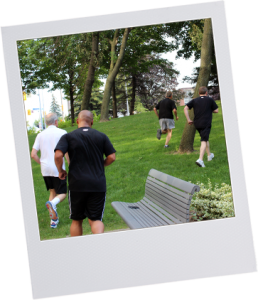 60% of Canadians are not getting nearly enough physical activity to maintain their health. We realize you’re either busy at the office, rushing home, in transition somewhere in-between or simply not motivated enough to do anything for yourself after a busy day. Not to worry. We’ve figured out a way to make you active by removing these barriers. We know that through a quick activity break you’ll feel alive. So, we’ll help you move your body and you’ll reap the benefits. It’s as simple as that. What’s this revolutionary idea? A quick activity break at work. Give us a bit of space i.e. a boardroom, hallway, parking lot and we’ll use it to get your workforce moving. We’ve got all areas covered. You choose a class type and we’ll be ready to roll. 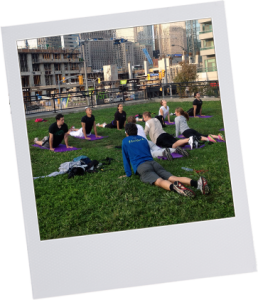 Mat exercises designed to relax, strengthen and promote flexibly. High-intensity sessions combining weight training and cardiovascular activities. Energy-boosting cardio workouts; a spirited and fun way to shape up. Connect with us to get a full list of all our ProactiveFitness class descriptions. We have over 20 exciting exercise classes. Here’s the kicker – 78% of our program participants have said if it wasn’t for our at-work fitness programs, they wouldn’t engage in physical activity. Well, we are happy to make being active a reality! We don’t just provide fitness instructors, we create a complete program that addresses your needs. Say everyone in the class is suffering from a common back pain. 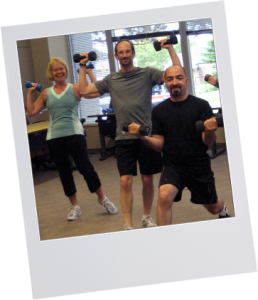 Our 12 week programs can be tailored to help all participants reduce their pain. Then we’ll measure the collective accomplishment to encourage others. Ready to see change? Let’s get moving. First and foremost, if you want to feel better, be more productive, have more energy and perhaps even live longer then you need not look further than exercise. Secondly, participating in group activities builds camaraderie and teamwork. By working together towards shared goals, such as improved health, class participants provide a great support system, encouraging fellow members to keep their eye on the prize. By facilitating social cohesion and friendship, group fitness classes contribute not only to individual health and wellness, but help to create a positive and healthy organization. Exercise boosts health conditions, combats disease and controls weight: No matter what your current weight, being active boosts high-density lipoprotein (HDL), or “good,” cholesterol and decreases unhealthy triglycerides. In fact, regular physical activity can help you prevent or manage a wide range of health problems and concerns, including stroke, metabolic syndrome, type 2 diabetes, depression, certain types of cancer, arthritis and falls. Exercise improves mood: Need an emotional lift? Or need to blow off some steam after a stressful day? A workout can definitely help. Exercise boosts energy: Physical activity delivers oxygen and nutrients to your tissues and helps your cardiovascular system work more efficiently, resulting in feeling energized. Exercise promotes better sleep: Struggling to fall asleep? Or to stay asleep? Regular physical activity can help you fall asleep faster and deepen your sleep. Exercise can be fun: Physical activity gives you a chance to unwind, connect with others in a fun social setting and engage in an activity that makes you happy. Ready to see change? Let’s get moving!